What are the Benefits of Social Engagement for Customer Service ? BRANDING – establish expertise and build awareness of what your business does. SPREAD NEWS - Tell about new product deliveries, new sales initiatives, etc using less time and less money than traditional media. PROMOTE ALL TOUCH POINTS – drive traffic to all media initiatives (newspaper ads, blogs, web site, flyers, etc). 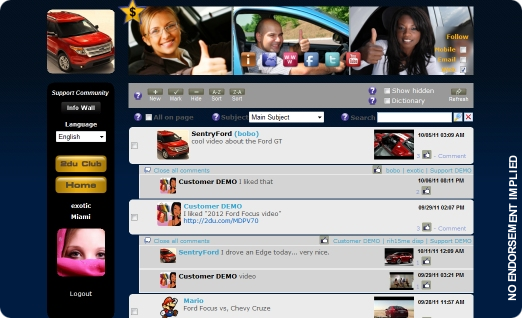 MARKET RESEARCH – get instant feedback from your customers. EMPLOYEE or TEAM COMMUNICATIONS – enable communications between employees or between project teams. BUILD LOCAL PARTNERSHIPS – both learn from and teach your fellow business owners. Identify co-op opportunities. 2du’s GeoHelp Platform lets you use leverage these benefits, and these apply to ALL TYPES of businesses including manufacturers, retailers, non-profits, religious organizations, and many more ! Please click here to see an example. Click here to read more about our GeoHelp Platform.